Having decided that the mid week weather was looking rather dodgy we ignored the proposed generation forecast and headed for the White at Rim Shoals. Generation had been roughly 1100cfs throughout the night giving a level of 452 which is very wadable and in fact opens up some nice riffles to the bigger fish. Unfortunately this increased to 3000cfs at 7am giving 453 and then gave a blip of 6000cfs at about 10am which meant we would have rising water from about midday. The only benefit of that unfortunate schedule was nobody else wanted to share the water with us! Oh well! We had fishable water so let’s go for it! The water registered 60 degrees and there was some floating debris (actually a log nearly took my fishing partner out later on!) from the generation. 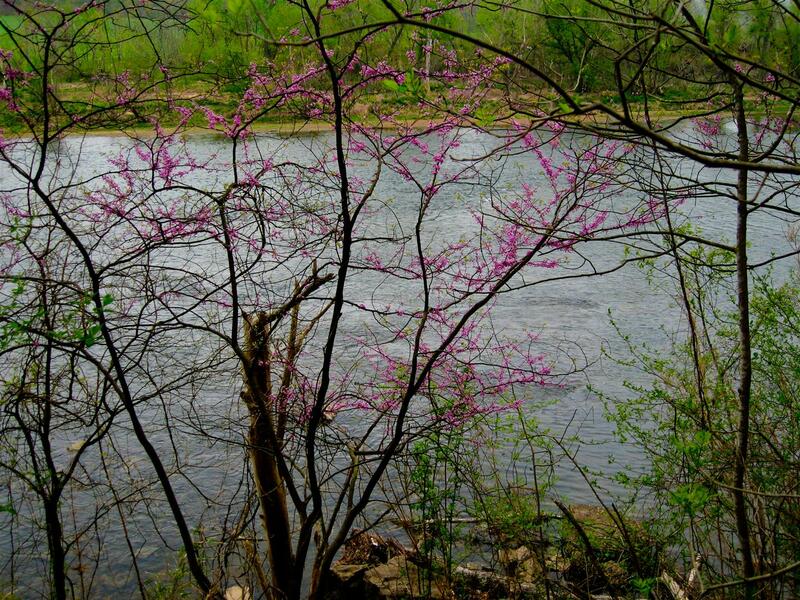 The Dogwoods had begun blooming and the Redbuds were almost over but still made a pleasant addition to the river view. 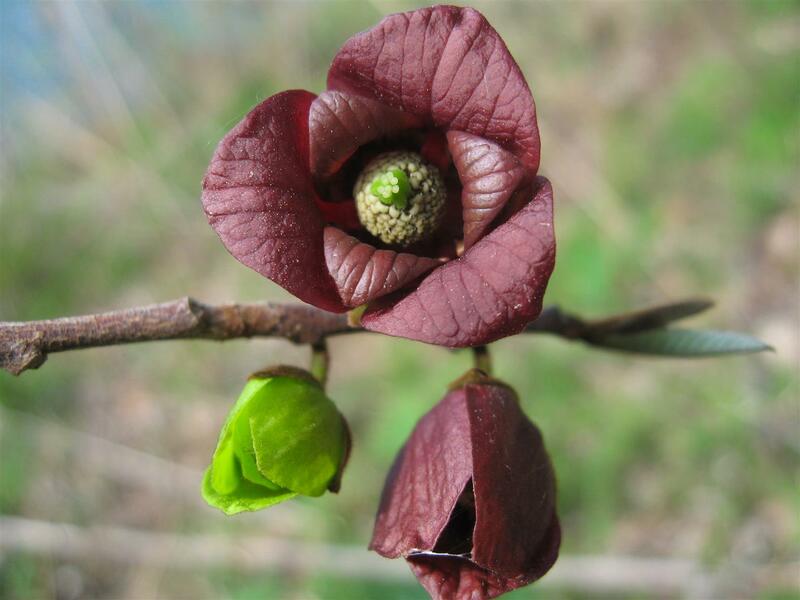 Most of the trees and bushes had started “greening up” and I even saw masses of Paw Paw blooms. 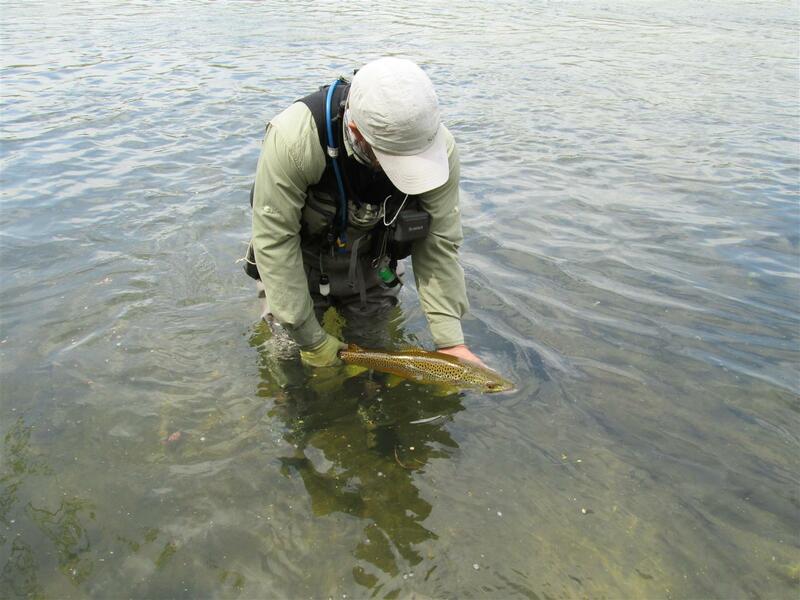 A few tan caddis were on the water and just the occasional rise drove me to the caddis box and a #18 tan caddis. This didn’t excite my “trouty” friends but a change to a #14 olive caddis did. Over the next couple of hours I worked my way round the lower riffle and caught about 15 rainbows all in the 10 – 12 inch range. All the fish were healthy and strong. Towards noon the water began to rise to an extent where I was considerably more careful where I waded and I decided to head to the drop-off and fish from the ledge. By this time there was considerably more flotsam which tended to snag on the hook so I decided to switch to a soft hackle and work some rises I had seen downstream of the drop-off. Well after that I couldn’t care less what the water did! But being dedicated to this sport I joined my partner and we headed downstream to fish a run that works when the upper reaches are out of bounds. I managed a few more fish on caddis but there seemed to be very little interest and even my trusty soft hackles didn’t produce any fish. My believe was that there was so much food being blasted down the river that the fish couldn’t be bothered to come up for a dry or “near” dry. Maybe I should have listened to my Guest Blogger and brought my nymph box! 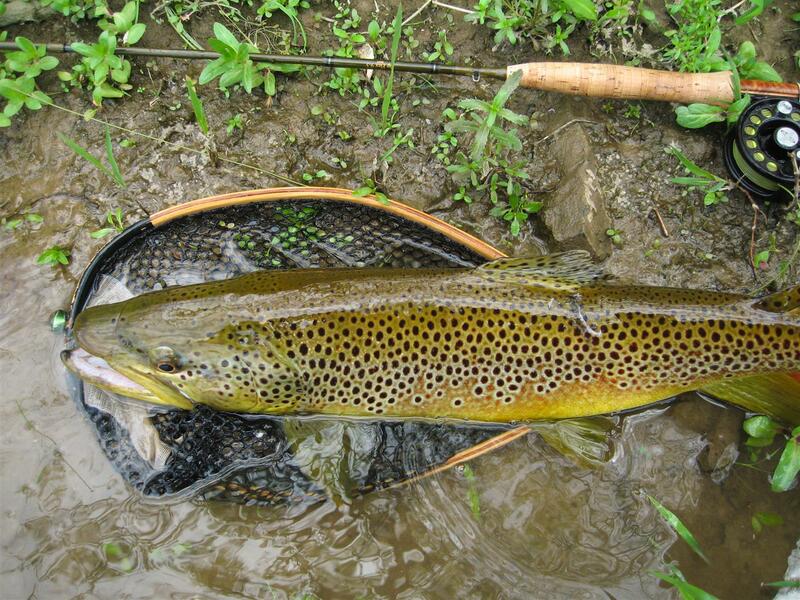 One other thing that made that day even more special was a reappearance of our friend the Midwest Salomonfly. We saw two more during the day both of which flew off the water and passed over our heads like a couple of large helicopters! After a final few casts to some fish that were midging in a back eddy (without luck) we decided to head for home. Considering the water level had been more than desirable for most of the day, we still had a great time and the memory of that large Brown testing my knot tying will be with me forever. 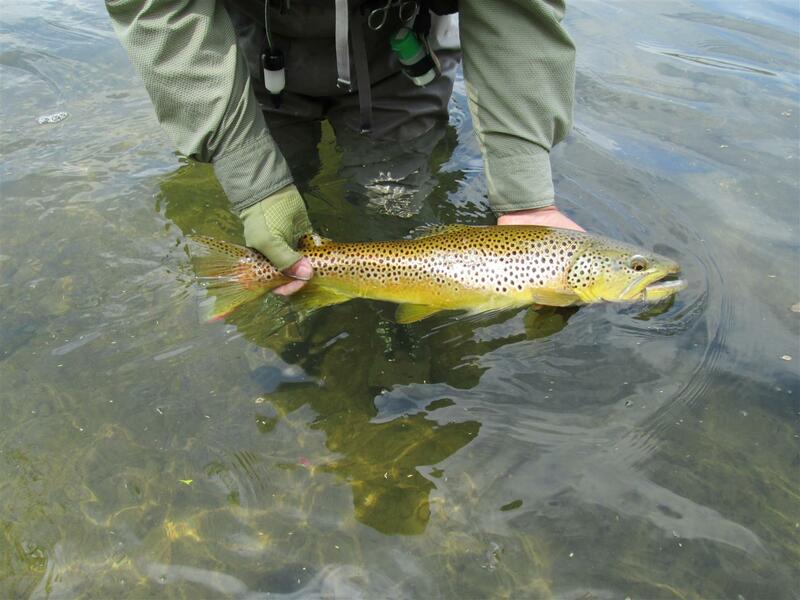 This entry was posted in Fly Fishing, Stream Report, Uncategorized and tagged arkansas, brown trout, caddis, cotter, fish, fishing, flies, fly casting, fly fishing, keith, Orvis, oxby, ozarkenglishman, rainbow trout, rim shoals, softhackles, stone flies, stone fly, trout, white river. Bookmark the permalink.